Rolling Your Own Metal: Is it the Capital Investment Your Company Needs? There comes a time in the growth and development of a business when a crucial question is flipped. Before: Can I afford to invest in major capital expenditures? Now: Can I afford not to? Based on hard work, a keen eye for craftsmanship and excellent customer service, you are starting to see success with your roofing and/or metal siding installation business. In the initial phases of your operation, you were able to secure partnerships with vendors to supply your cut-and-formed metal, and the margins on these exchanges have been enough to keep your company profitable. Nevertheless, as you look towards the future, you wonder if your existing supply chain is sustainable. Most crucially, your five-year-plan calls for aggressive growth; to achieve this you are going to have to scale up production without a corresponding increase in supply-chain expenses. Even though you are turning a profit now, you know you need a capital investment plan in order to achieve the lofty long-term goals you have for your company. You need to look for ways to reduce costs, while also finding new streams of revenue. In this instance, it is clear that for your company to achieve its goals you’ll need to be able to take control of your own production, a move that can increase profit margins as the volume of your contracts increase while also enabling you to tap into new revenue sources, supplying the material you can now create to other up-and-coming contractors. That’s right. It might be time to invest in a rollforming machine. But how can you know for sure when to take the plunge? Is now the time to invest in a rollforming machine? For many successful entrepreneurs, the upfront costs of large-scale capital investments can become a significant source of anxiety. It takes both prudence and courage to project the future growth of the company and weigh it against the current financial conditions. Many roofing contractors and other metal fabricators choose to make only modest improvements in the tools of the trade, investing in extrusions or press-braking/stamping operations that might be sufficient for the current volume and scope of your work, but what about in the future? If volume increases sharply, and you certainly hope it does, will more modest capital investments be able to satisfy these demands? Perhaps you should consider a system that can grow alongside your business, such as our Titan Series rollformer, which you can initially purchase as a single deck, expanding to the double deck once ROI is secured. What if your customers start demanding more complex construction trims? Will a cookie-cutter-style solution be able to accommodate this? Perhaps instead you need a multi-trim rollformer capable of accommodating up to five unique trim profiles. How about if the competitive landscape in your region changes? Will your equipment be able to adapt to fill needs that the rest of the marketplace can’t handle? 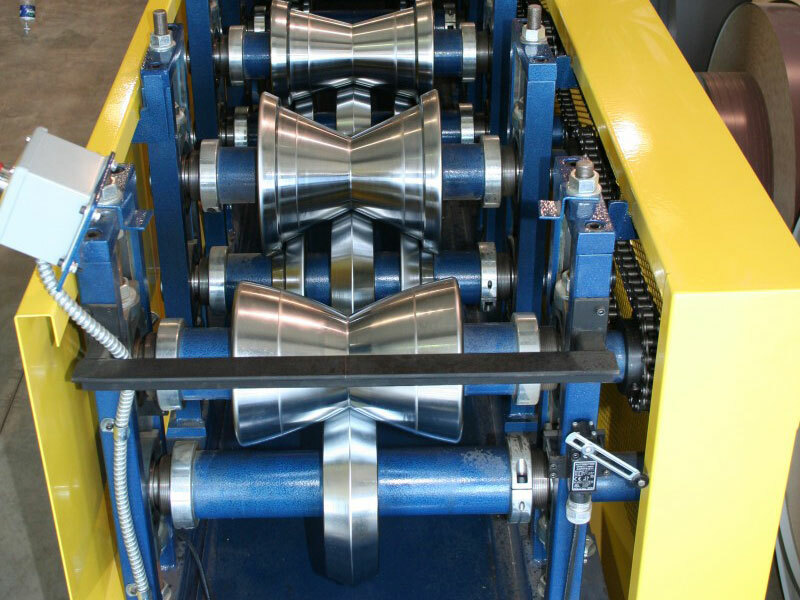 For many companies, the investment in rollforming technology marks a transition from being a simple contractor to also becoming a manufacturer and supplier. Naturally, the needs and demands for these two distinct product lines are different. Is there a market for the supplies you intend to produce? These types of questions will not only enable you to determine if and when you should make your own rollform investment, but also which of the many solutions is the right one for you. Which rollforming solution is right for me? When a company’s management makes the decision to invest in capital improvements, they are making a clear statement to their employees, their customers and the competition about the trajectory of their business. And this statement will resonate for years to come, so it’s important that a company doesn’t overextend themselves with their investments. But an all-too-common mistake many companies make is to spend on capital improvements that quickly prove insufficient, or inefficient, as your business changes. For companies involved in rollforming, the mistake could be to invest in a dedicated machine that does only one thing, only to later find out that consumer demand has shifted and they need a machine that can automate the production of metals of various width, height, gauge and punch patterns. To find the solution that meets you and your customers’ needs, both now and in the future, secure a rollforming partner with the knowledge and experience to ensure you are making the right decision, for now and the future.